Boy is it a muggy one today. I just walked KB to childcare and because I am inexperienced at childcare drop off (that's Appleheart's gig) I forgot about half the stuff you are meant to take. So that means walking back. Or maybe driving. Because it's such a muggy one. 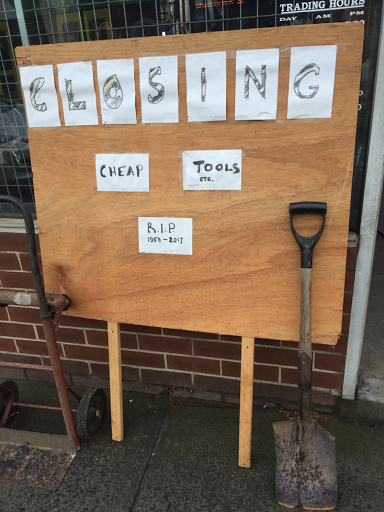 Anyway, I spotted this sign outside one of Preston's many nondescript junk shops that never seem to be open. This is the most open it's ever been, and just to tell us that it's closing. Sad. The tools certainly appear cheap, but I didn't ask for the price.